Fine weather with clear skies appears over the village. The Swifts, which have been noticeably absent during the previous dull weather, have returned to their routine low level roof-hugging evening flight. Their screaming calls ring out even as dusk approaches. I assume that their favoured insect food has hatched in large numbers in the gardens and fields as the weather has improved. The groups of Swifts include their newly fledged young, now airborne and ready to stay that was until next years breeding season or perhaps longer. As I chat with Piet outside the cottage, another streamlined hunting form appears overhead – a Hobby causes panic amongst the Starlings, but the Swifts carry on without visible concern. Butterflies have not had a good year so far in Brampton, or elsewhere. In spite of our joy and finally finding the Silver-Studded Blue Butterflies on Buxton Heath, the more common species were not appearing. Then a brief respite in the wet weather gave rise to a brief burst of Red Admirals, particularly on the early Buddlejas. Then, since last weekend 21/22nd July, the Ringlets, Commas and Meadow Browns appeared. Helen was alarmed to hear that Cabbage Whites had been seen near the allotments – apparently her vegetable plants are at a vulnerable stage. It is mid-July, the Roe Deer appear to have completed their shenanigans. Their barking calls, which recorded the rivalry and pursuit of the females by territorial bucks, reached a peak of during the late evenings of the past week. They could be heard from the village – the sound echoing over the valley from their woodland arena. But now, the buck can be seen in the open, he is escorting one doe and they have separated from any competition. The two deer watch me part nervously, part disdainfully from the hafllinger field. They keep their distance and carefully increase it if I approach too closely. The buck’s summer coat shows him to be in peak fitness and condition. This year there is no sign of the scars of battle which he carried on his left flank last season. I manage to capture a poor photographic image as he meets my gaze. Last Sunday brought a successful hunt for an uncommon butterfly. The sun came out and raised the temperature as soon as we reached the Heath. 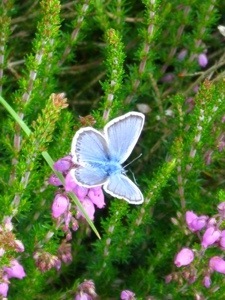 We were hopeful following a tip-off from a local recorder that the Silver-Studded Blues were on the wing. In what is known as the “usual place” eight males and a single female put on brief display as they fluttered amongst the Bell Heather. This all came as a great relief as our searches last year were too late and fruitless. An idyllic early July morning. As we walk out with the dogs along the old railway line, we seem to have the world to ourselves – or almost. Ahead, a Barn Owl has its usual spat with a Sparrowhawk – they briefly lock talons again before the hawk shoots off. Both predators are working hard to support growing offspring. The Sparrowhawk, in particular, seems to be hunting constantly, his presence given away by the twitter of mobbing Swallows. The Swallows’ call instantly draws attention of prey species and us – the birdsong goes quiet until the perceived danger has passed. Near Keeper’s Wood a single Roe doe keeps a close eye on us from 80 yards distance and then slips seemingly unconcerned, back into the trees. The sun is hot but a welcome wind keeps temperatures down. We hear news of Golden Orioles, but our wish for a sighting is not answered. This brightly coloured continental birds, somewhat resembling large thrushes in size, are known to breed in the UK and we hope that their presence in the area is a good sign. Orioles are supposed to be especially fund of the canopy provided by Poplar trees, so they should feel at home here. Barking sounds emanate from the woods. The Roe Deer rut is in full swing or so it seems. Yesterday evening their enthusiastic, somewhat primeval barks echoed along the village street as midsummer darkness descended. Demanding young are not confined to the breakfast table. Over several mornings this week, the call of a hungry young hawk has disturbed the otherwise peaceful morning chorus. On one occasion the demand for food led to an attempted mugging – a Sparrowhawk accosted a returning Barn Owl in an attempt to grab it’s prey. They span to the ground linked by their talons before the Sparrowhawk gave up his attempt. One of the benefits of warm Summer rain is the greater apparent presence of many wild scents. The Woodbine or Wild Honeysuckle hangs in the air at several spots along the old railway line, the verges give off the smell of damp hay and lenses of roses spill over from the cottage gardens.